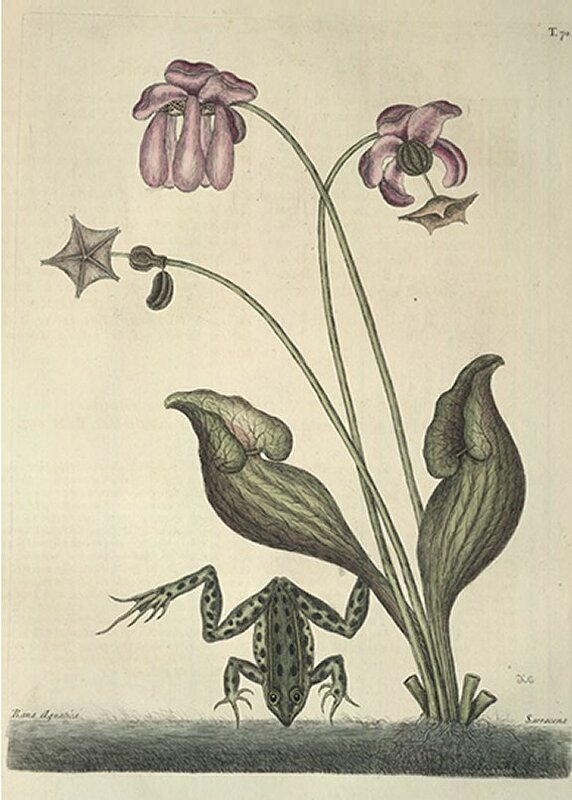 These Frogs are of various Sizes, tho' commonly about the Bigness of the Figure Their Limbs are very long; the Upper-part of the Head, Body, and Limbs dusky Green, spotted with Black: From the Eyes to the Rump extends two yellow Lines; two white Lines also reach from each Eye to the Nose The Eyes are large, black, and circled with Yellow Irides. These are not seen on dry Land, they frequent Rivulets and Ditches of Water, and will leap at once five or six Yards. The Leaves of this, like the preceedent, spring from a fiberous Root, to the Height of six or eight Inches, they are likewise hollow, swelling and more protuberant than the former, and differently shaped, as in the Figure; they are of a yellow green Colour, striped and veined with Purple. The Flowers of this Plant rise considerably higher than the Leaves, and are of a purple Colour, except which the Flowers and Seed Vessels of this and the preceedent are formed alike. The Hollow of these Leaves, as well as of the other Kind, always retain some Water, and seem to serve as an Asylum or secure Retreat for numerous Insects from Frogs and other Animals, which feed on them. These Plants grow usually in the same Places with the foregoing.